Ramona Brazilian Jiu-Jitsu / MMA is a Martial Arts School offering Brazilian Jiu-jitsu, Kick Boxing, Mixed Martial Arts (MMA), Muay Thai & Wrestling classes in Ramona, CA for kids, men and women. 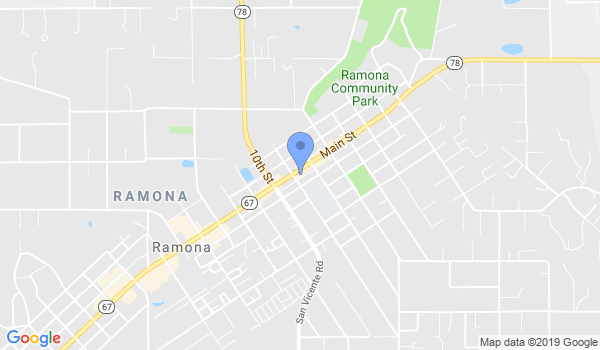 Ramona Brazilian Jiu-Jitsu / MMA is Located at 2102 Main St..
View a Location Map, get Directions, Contact Ramona Brazilian Jiu-Jitsu / MMA or view program details below. If you are a student at this school, help your local Martial Arts Community by writing a Review of Ramona Brazilian Jiu-Jitsu / MMA. You can also help your school by sharing it on Facebook, Twitter, Google+, Pinterest etc. Ramona Brazilian Jiu Jitsu/MMA is a locally owned family training center. We offer a family orientated Mixed Martial Arts school that is positive and friendly, without overenthusiastic egos. All ranked classes are black belt instructed by owner Kevin Hosseini. In addition, all kids classes include trained assistant instructors to ensure small group and personal instruction. We provide the highest quality programs for both adults and children. Classes are held Monday through Saturday. For a detailed schedule, visit www.RamonaMMA.com. Thank you! Would you like more information on hours, classes and programs available at Ramona Brazilian Jiu-Jitsu / MMA? Please contact the school with your questions. Update the details, Write a Review or Report Error of Ramona Brazilian Jiu-Jitsu / MMA. View all Dojo in Ramona or in Zip code 92065.